Flex rating 1-5: 1 = Really stiff! 5 = Really soft! This board is available through our dealers as deck only or complete with components from leading manufacturers such as Randal, Paris, Retro, Holey and ABEC 11. Har noen spm angående dette brettet. Kan jeg sette de truckerne (paris) som fulgte med på fibrefish hard 09 på dette brettet? Vil jeg være for tung for dette brettet når jeg veier 90 kg? We recommend “180” trucks on this model, and my guess is that the ones you have are “150”. 150:s will work on this board though and will give you a more “turny” and lively ride than with 180:s, but in our opinion 180:s are preferred to get as much out of this deck as possible! There is no problem in mounting the trucks, and it will not break at 90 kgs! You might want to watch out for wheelbite though depending on your wheel shape and size. Just wanted to say that i’ve had my new twin for 5 days now, and i think im in love..  the board is super sweet. This is my first slipstrem (have 2 outher boards, i wont say witch out Of respect) but yours is the best by far..  its easy to controll and is a super smooth and stabel ride..  Thanx gays..
Hej slipstream jag undrar om ni rekomenderar att man sätter på spacers på undersidan av brädan där skruvarna sitter för att fördela vikten. Thanks for a very good question Emil! Washers (“brickor”) are highly recommended on all our drop-through decks as they distribute the pressure from the locking nuts on a bigger surface. All our dealers have been informed about this and should be aware that smaller cosmetical cracks are more likely to occur if washers are not used properly. That being said, the board will not break if washers are not used, but will probably last longer and look better! Hey, i was wondering if i shoud choose this board over the platypus? like ive been cruising on several longboard over 4 years, and i decided i wanted to start sliding/switching, manuals etc. do you reccomend this board or the platypus? The Twin and The Platypus are very different boards and are pretty hard to compare. For manuals, The Platypus is obviously a better choice due to the functional tail shape, and The Twin is a more solid “high speed” slider due to the wider platform/body shape. Ask your local dealer if you could try them both or at least stand on them in the shop, since this in many ways is a matter of personal preferences and taste. Bear in mind that wheel size/shape/hardness are very important factors to consider when sliding as well. Hi! I was just wondering if this board is good for carving. Or should I look for another one? 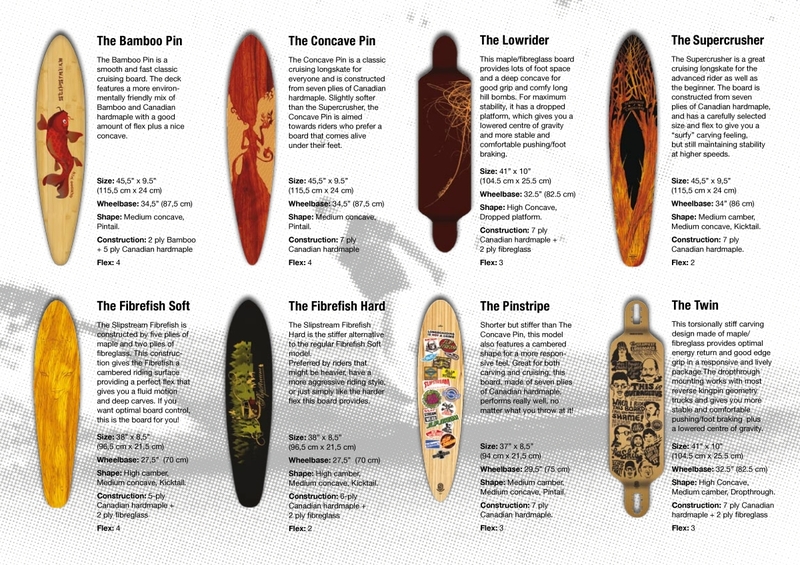 This is probably the best board for carving in our quiver, so it is a solid choice in our opinion! For sliding, do you prefer a long or short wheelbase? I like the design of this board, with the huge cut outs and the drop-through mounting of the trucks. Compared to my current board, with regular truck mounting and a shorter wheelbase, how will this compare in stability/slide? Simon! – This is a flexy, but still pretty firm, good over-all ride. Works perfectly with the Paris trucks! Regarding the Cadillac Wheels, just make sure you get the new wide ones for a smooth grippy ride. Viktor! – Different wheelbases are good for different slides! For super technical “slidefest” slides a shorter wheelbase is better. Regarding the comparison with your current board, the longer wheelbase and lower profile on The twin will make it a more stable ride. Always remember that choice of wheels is a key factor in how your board will slide! 1. is longboarding for everybody ? i’m not too young right? 2. in my city there is 2 skate-shops. i just wondered if this board can have every trucks that they sell there can be used on this board. because i am maybe going to buy a “the twin” complete board from http://www.jovial.no. 3. is this board that is “symmetrical” only for “tricking”? or is it a “speed” board to? Hi Markus and thanks for the message! 1. Longboarding surely is for everyone and age is not an issue! 2. 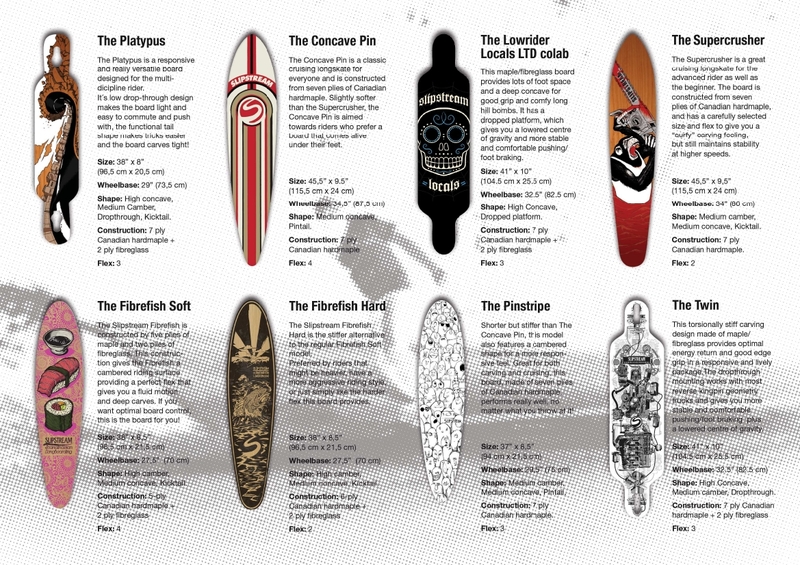 Nearly all trucks fits this board, but your local dealer can help you avoid any mistakes. For this board we recommend “Reversed Kingpin” geometry trucks in size around 180 from Paris, Randal and Holey. 3. This board is NOT only for tricks (you have better options for that in our lineup), and it handles speed well in our opinion! This Board is sick! god for sliding, carving, even tricks like manuals and other tricks that need a little tail. My first board was from u guys, the Concave pin 2007 edition. Loved it. So flexy and very nice for both cruise and slide. Could not have gotten a better beginners board. Thats the one who got me hooked in the first place. I have now bought a loaded dervish, just wanted to know if some of the their boards inspired you? Hi, just purchased this board and Im very satisfied. I have holey trucks and “retro 75 BigZig” wheels. But i want more carving, is there any other wheels you would recommend to me? Hi, Marcus good to hear that you like the board! You could try go down one size on the wheels to around 70 mm, but stick to the wide profile with “lip”. Wheels are always a really subjective matter, and different riders like different wheels according to personal preferences and taste. Perhaps you could swap wheels with friends a couple of times to compare the differences? hi again! i have one more question. is this board delivered with griptape? i have’nt find one picture of the board from above. and how long and wide is it? The board is gripped and the size of this board can be found in the top section of this page! Jag hade tänkt köpa en denna brädan och har en fråga! Jag ska köpa dessa truckar http://www.longboardshop.de/shop/product_info.php?cPath=36_143&products_id=611 och undrar om dom passar denna brädan, vilka skruvar m.m rekomenderar ni för att brädan ska hålla så lång tid som möjligt? Oskar – Holey trucks work really well on this board. Any hardware 1″ and up will work, but we recommend “round” (not flat) head bolts 1 1/4″ + washers. kan ni ge mig några förslag ? Thanks for the message Mathias! In our opinion, this is a solid choice for cruising and carving! Can’t really see that you answered Mathias question there which would help me out aswell. I’m not a beginner, I ride a Lush Spooky (older model the 107cm one) with force trucks (can’t remember which) and soft gumballs. Anyhow, my capoeira instructor tried it out and now he wants a board…. but he doesn’t want to cash out too bad for it. Do you have a good beginners board that would cost around 2000kr or less? Ps: I know this is a silly question, you usually get what you pay for when it comes to longboards and I usually end up spending around 3000kr on a new set. Beginners usually like this board a lot for its low centre of gravity, and wide, stable platform, so in our opinion it is a good board for beginners as well. As for the pricing you should contact one of our dealers regarding that, but the board including griptape will cost you less than 2000kr for sure! If you mean a complete board that would depend on what parts you choose. Expensive trucks, wheels, etc will set you back more than if you find parts that cost less! Talk to one of our dealers and they will help you out for sure! We try not to put a maximum weight on our boards (but perhaps we should as we get a lot of questions about this!). If you are heavy, the board will flex more – if you are light the board will flex less! Go visit your local dealer and see if you like the way this board flexes, but it has a pretty “firm” flex when compared to other boards in our lineup. hello! i am going to buy my first longboard and i got some questions if i want a good Trick, cruisin and carving board what board should i get the twin or the platypus and what truck and wheels should i buy?? For tricks you should choose the Platypus. For higher speeds and less tricks you should choose The Twin. Regarding trucks you should choose a “Reversed kingpin” truck (180:s on The Twin) with bushings that you like. Regarding wheels you should choose smaller, harder and narrower wheels for easier tricks. Wider, softer and bigger wheels are more comfortable and grippier – better for carving and cruising. Kan jeg bruke dette forumet hvis jeg bare vekt 50 kg? Jeg mener vil det være mykt? At 50 kg this board will not flex that much, so it will be pretty stiff, but it is no problem to use it. If I jump on it, it will bend? Johannes – It will bend/flex. How much depends on how high you jump. If you go to one of your stores , will you be able to choose the trucks , wheels and ball bearings? If so , what would you recommend for carving on this board? I have to say this bord has beautyful graphics! Most of our retailers will be able to let you choose the parts you want, but some only offer boards that are already assembled. Check with your local dealer! I wonder when the board will be able to buy from any swedish longboard store again. cant wait to order this beast! Unfortunately production is having a hard time keeping up with demand on this and other models. It looks like we will catch up in early July, so please bear with us until then! A couple of weeks ago i bought “The Twin” longboard. This longboard is just fantastic!Wow,you have excellent control of the board in higher speeds, and for the how will now,i have flywheels 90 mm and that works great! a great choice for these people how wants to get a nice ride in hills but also in cruising! I have now leanerd to do 180 slide and manual,dancing,and some others slide,but my question is: why can i not do 180 slide without hands on the ground? It doesnt`work! I have tested to have my feets very wide backwards,but the longboard will not turn and do 180,should i get some others weels or trucks,bushings? HELP,beacuse the trick is so cool in higher speeds! Hey Arvid – Cool to hear that you like the board! It will be so much easier for you to slide with smaller, harder and narrower wheels. Take a look at the Retro Freerides which are highly recommended. I’m a beginner and I want a smaller board with drop thru and “cut outs” on the deck and easy to learn slide and tricks. And I don’t really go so much carving not fast anyway. So I don’t know really what board I should get. The playtus or this one? How much do they cost? To me it sounds like “The Platypus” will be a good choice for you. Better for tricks in our opinion. tjena, jag köpte denna, the twin, utan truckar och ska använda mina gamla truckar från min förra slipstream.. antingen är jag bara jävligt trög eller så är det lite bökigt att montera truckarna.. ska jag skruva isär truckarna för att få igenom dem i hålet.. som sagt detta är säkert väldigt lätt men jag behöver lite tips. tacksam för svar! Your local dealer should be able to assist you in the assembly of your board. All dealers are required to offer this service to their customers! That being said, this board can naturally be ridden “top mounted”, but to use the drop-through mounting option, simply disassemble your truck and mount the baseplate on top of the board, and put the hanger & kingpin back in the baseplate from the opposite direction (the bottom of the board). Please take a look at the pictures above for further reference. Hi! I have been longboarding for 4 months now, and have a board that’s not ideal for sliding and carving. I want to learn some sliding, and be able to carve smoothly, which board should I choose? The Platypus, The Twin, Or The Lowrider? This board is highly recommended for smooth carves and sliding with power and speed. Hi again, would this board Work with Sector9 Gullwing Sidewinder Trucks? Or should i go with some Paris, or Randall 150/180s? You should definitely go for the Paris/Randal 180:s.
Your best bet is to visit your local dealer and try before you buy. In our experience though, The Lowrider has a slight edge over The Twin when beginners try both out. This board weighs in at about 2 kgs, carves good and you can have pretty much any size wheels as long as you have wider trucks (“180:s”). The flex will be pretty stiff and stable at your weight. The flex number that fits you depends on what kind of flex you prefer! At 30 kgs pretty much all our boards have a firm, stiff flex. 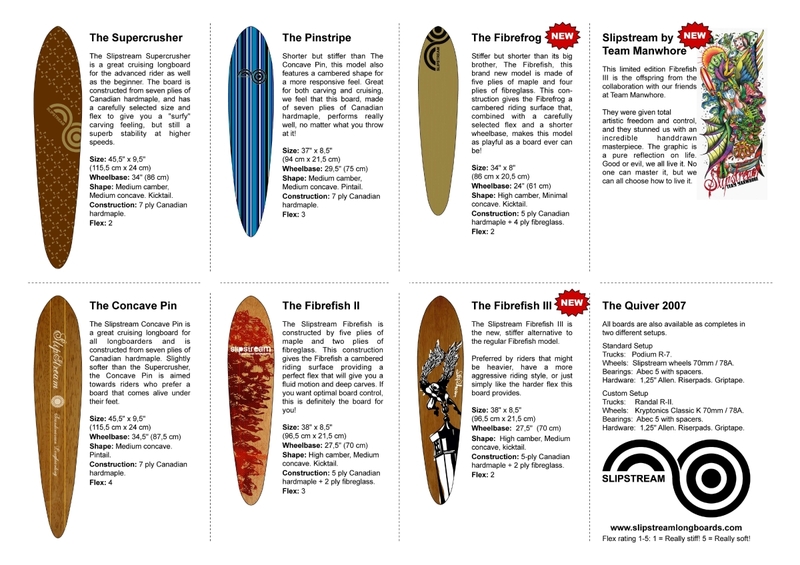 The Fibrefish Soft might be the only of our boards that will flex for a 30 kg rider. Our best bet for you is to visit your local dealer and find out how the boards flex for you. Try it before you buy it is always a good suggestion! What kind of longboard is this? is it the cruising longboard or the tricky longboard? This board is more for Carve/Cruise than tricks in our opinion. I was wondering what board you would recomend, The Twin or The Lowrider. My kind of riding is medium/high speed (40-50 km/h), sliding and cruising on turny small roads. And what whould be the best setup regarding the wheels, size and hardness? I’m thinking of getting this board but only the deck since i already have trucks and wheels but I’m wondering if my gullwing charger 180 trucks will work with his board? Gustaf – Thanks for the kind words, we are very happy to spread the stoke to you! Joakim – We have actually not tried the trucks you mention – Perhaps you could try it with your local retailer before purchase? This board will actually be pretty firm/stiff at 60 kgs, so you might want to check out “The Lowrider” for a more flexy ride (and the Chargers will fit that board for sure!). Ruben – This board will suit you well in our opinion. A wheel around 70mm/80A is good all-round. Choose a wider profile fore more traction and a narrower for easier slides. Skated a lot 30 years ago. My sons have just started longboarding and it looks so fun. So I Just bought the twin with Paris trucks and Retro 70’s. What a wonderful board. So easy to bring back the feeling from past. I am 48 and weigh in at 100 kg. It carves like a dream and yet stable at speed. Ordered one today. Cant waitfor the delivery! Got one today. Awsome board! ” Need to try ” board! Have ridden my “the twin” in a cuople of weeks now and I’m very stoked! Super nice to carve and slide with, also works great just cruisin around in the town. Recommend it! My brother likes this board and he wonders if it’s hard to slide with this board? I’ve got the platypus and it’s pretty easy to slide with that board so what’s the difference between sliding on this compared to my board? The Twin is a solid slider, preferably high speed/aggressive slides. Always remember that your wheels are the key components to how your board will slide. Hi, i just wondering what it is for type of Bushings on The Twin 2009 model. And i also wondering how stiff it is. The bushings are different on different trucks but can easily be changed to the desired shape and durometer. The Twin is pretty stiff to be a flexible board, but that naturally depends on what you compare it to. I have bought this deck to use with my independent 169 trucks and ZigZag 66mm 80a wheels, is it possible to both top-mount and drop-mount the indy 169? We have not tested that setup, but at least for topmounting there should not be any problems. Hope everything works out for you and please report back on how the board rides with that configuration! Would it work to drop-mount my independent 149mm trucks on this board? Can’t say that I want to buy a board and then realise that it doesn’t fit. Mounting Indy 149:s will work, but in our opinion you should go for a wider truck. A truck this narrow strongly limits your choice of wheels, and on a board this wide you will get a pretty “unstable” feeling compared to using a wider (preferably longskate specific reversed kingpin) truck. I have tested ‘the Twin’ with Independent 169 trucks, zigzag 66mm 80a wheels and Venom Eliminator (81a) (boardside) and Venom SHR Super Carve (86a) bushings (roadside). First I topmounted the setup, which was a good ride, responsive, quite turny and very solid, only a bit high and sometimes a bit wobbly. Then I drop-though mounted the trucks and i must say that this is awesome. Very stable ride, yet responsive and carveable, and a nicely low for pushing and footbreaking. All in all a great deck for a great price! Is The Twin lower than The Lowrider? For me it looks like the deck is closer to the ground on The Twin. The height of the boards depends on what wheels and trucks you use, as well as the usage of risers, etc. Using the same components and no pads on both boards (Twin dropmounted) shows that The Lowrider is the lowest board of the two. I want to buy a board for trickks, which one would you recommend? That really depends on what tricks you are interested in doing, but for more technical tricks, the smaller size and kicktail of “The Platypus” is a big advantage. Hi, the size from side to side is very big (25cm). Do that effect anything if you want for example trix, do mannuals and do slides? If you compare to other boards whit normal size like the Apex 37? If I want to do these things (slide, do mannuals and do trix) which are the best board for me? The Twin or The Platypus? This board is bigger and thus heavier than the boards you mention, making some tricks harder to do compared to doing them on a lighter board. Manuals and technical tricks are easier on a Platypus hence its tail and smaller size. Try it before you buy it if in doubt! Hey Will, thanks for the message! Unfortunately we have no physical retailers in the US (yet! ), but I will get back to you with a list of online retailers that probably could help you out! Hey ok thanks Im really hoping it might be possible to get one!!! This board should suit you well given your specifications, but if you feel uncertain you could always try your friends board again and decide for yourself. I have just decided to buy “The Twin”. It looks like a great board for not to much money. My only question is, if i use Randall RII 180 mm trucks with 76 mm wheels, will i wheel bite easy then or should i go with smaller wheels? If you use Randal 180:s in conjunction with this board, you can use 76 mm wheels (or bigger!) without risking wheelbite. Oh yeah, I’m 38 years old, 175 cm, 70 kg and I would definitely recommend this board for beginners and advanced alike. Love, love, LOVE the Twin! I’m locking for a “Newbie” board sens this will be my fist one. There are two things i’m wondering about, First, I’m 100+ KG and what stiffness do i need to not break the board and what board do you recommended for just cursing I thought this one looked good. You will be able to ride all our boards without breaking them, they will just flex more for you compared to the way the same board will flex for someone lighter. The golden rule as always is “Try it before you buy it” to see if you like the way any board flexes for you. There are no rights or wrongs, just a matter of personal preference! With that being said, this board should be a solid choice for you in our opinion. hi i am looking to buy a longboard, but has never gone before, but still want to learn. so this is a good option or is it better to learn on another board? The easiest boards to learn with in our opininon are low and wide, thus providing a stable ride for beginners. For 2011 The Twin, Lowrider and Wedgie all fit the bill. The Platypus could also be a sensible option for the smaller beginners. Hey I’m riding the lowrider at the moment and thinking of picking up the twin. What would you say is the biggest difference when it comes to actual riding of this and that board. I’m thinking that this board is more responsive and not that stable. But I’m not sure because I’ve never ridden a drop through board before. Hey Erik, thanks for the message! The biggest differences in our opinion is that The 2011 Twin is shorter with a shorter wheelbase. The Lowrider might be lower than The Twin (without risers), but The Twin feels just as stable (if not more!) when comparing the two. Hope this helps, you should really try one out to make your own judgement if possible! would you mind giving me some numbers? For sliding, harder, smaller and narrower wheels are easier to slide with, but it is possible to slide with all wheels, including the ones you have. Youtube and other videosites are filled with sliding tips. Good Luck! Kan man fortfarande köpa denna ? Knut: All boards from 2010 are since long sold out. If you are lucky you might find some left in stores though!